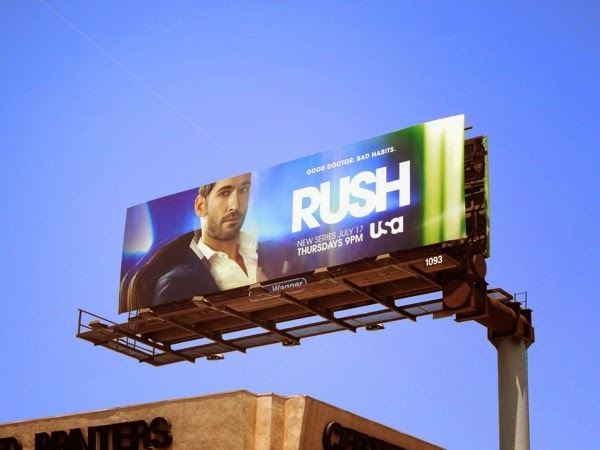 Don't be confused by the title of USA Network's new drama Rush, as it has nothing to do with the Formula One car racing biopic of the same name starring Chris Hemsworth and directed by Ron Howard last year. 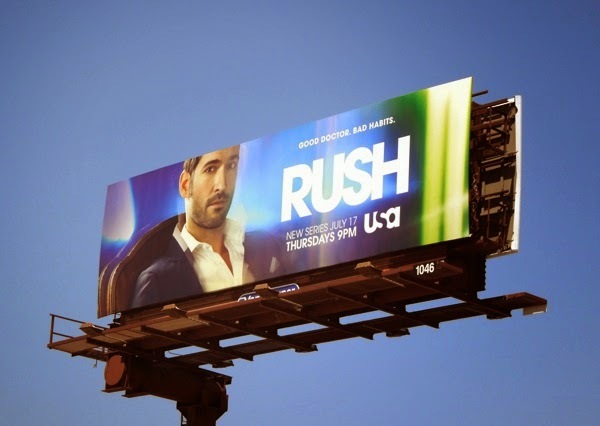 This latest offering for the Summer season of television stars Tom Ellis as a different kind of on-call doctor, one that caters to the rich and wealthy L.A. elite who can afford his high fees, with no questions asked. Think of the hard-partying 'Dr. 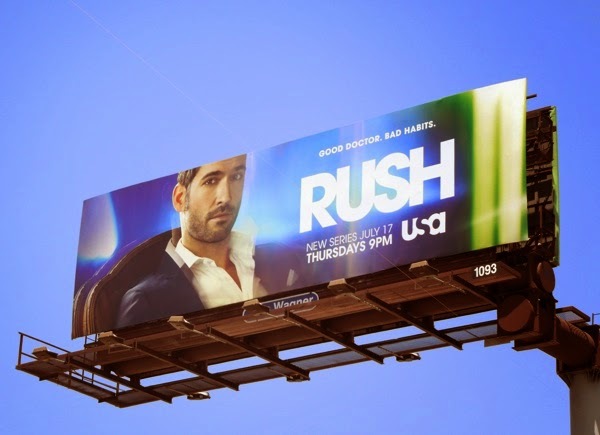 William Rush' as the 'medical fixer' equivalent of Showtime's Ray Donovan. 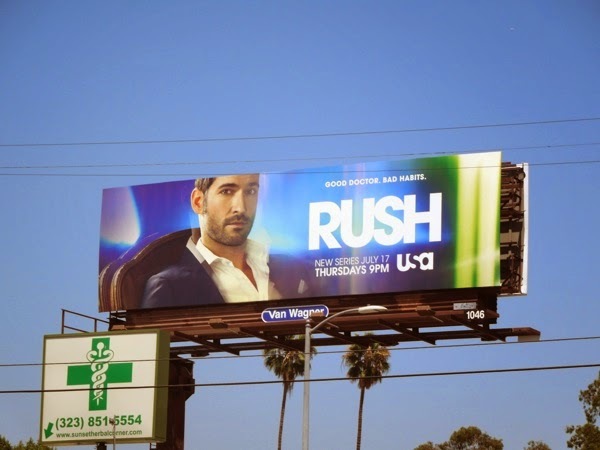 Welsh actor Tom Ellis is no stranger to playing a doctor role either, as he's well known in the U.K. for playing the dashing 'Dr. Oliver Cousins' in the long-running BBC soap, EastEnders, so his patients will be in experienced hands. 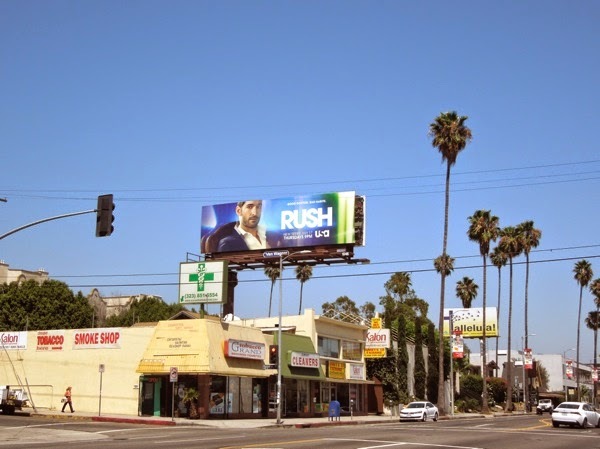 This slightly out of focus ad creative, hinting at this doctor's bad habits, was first spied along Cahuenga Boulevard on June 29, plus later along Sunset Boulevard on July 8, 2014. This doctor is in, and he'll see you as long as you can pay (which when you think about it, is no different to any other healthcare in America).